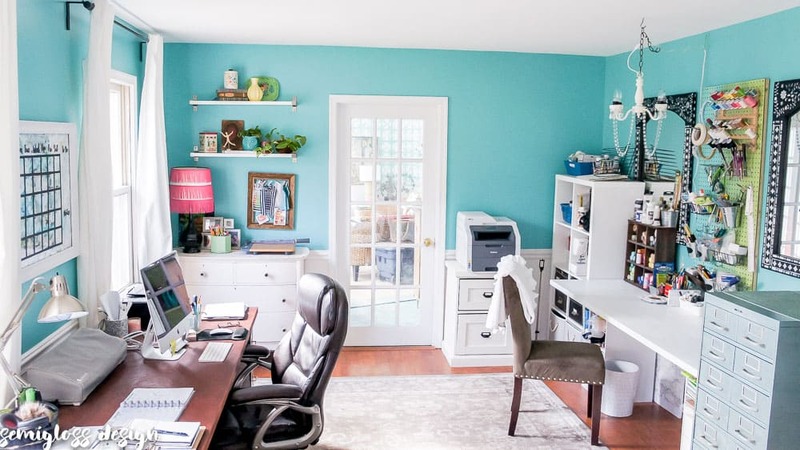 After five long weeks, it’s time to share my office makeover! There have been times during this challenge that I didn’t think it would get done. But I pulled through and got it mostly all done. It’s looking pretty lovely now! 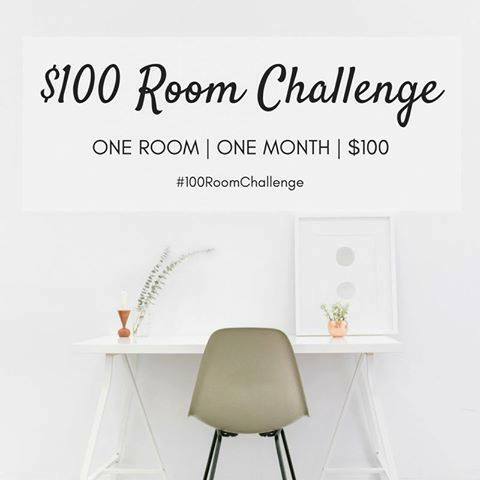 Twice a year, Erin from Lemons, Lavender and Laundry hosts a $100 challenge. 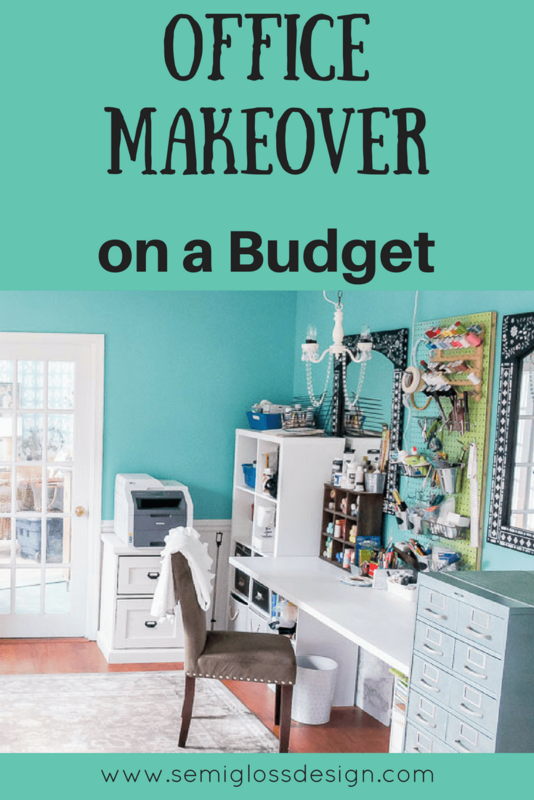 We have one month to complete a room makeover on a $100 budget using mostly what we already have on hand. It’s a good challenge to use things that you’ve been hoarding. 😉 This month, we got lucky that January has 5 Wednesdays, so it felt like a longer time to complete the challenge. I started with a messy office space and big plans. It’s so funny how inspired I feel to create now! Besides massive decluttering, I did some painting. My dresser got brightened with a coat of blush pink paint left over from my daughter’s room. The armoire that was here was moved to the garage where it’s awaiting a makeover to serve as a display cabinet in my shop. The IKEA shelves were bought long ago with intentions to hang them in my kitchen. Plans changed and they were left without a purpose. So now, they can serve to display pretty stuff. The right length of curtains were also hung. My chairs were slipcovered with dropcloths. If you come over, don’t look at them too closely. I am NOT an expert slipcover maker, but it made these once ugly chairs bearable until I find something to replace them with. 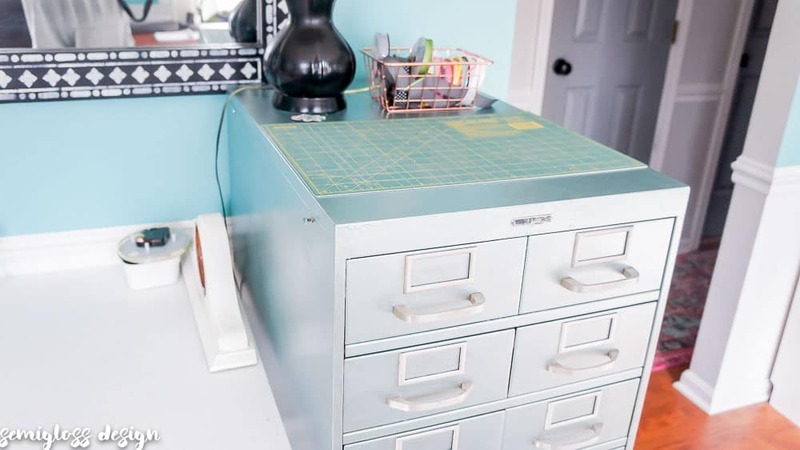 I used a galvanized bucket to contain all of my paper that I use for lining drawers. I’m really happy to bring in a bit of pink to this room. My hallway has a pink runner, so it ties the rooms together with the lamp and dresser. I even tamed the wire problem. 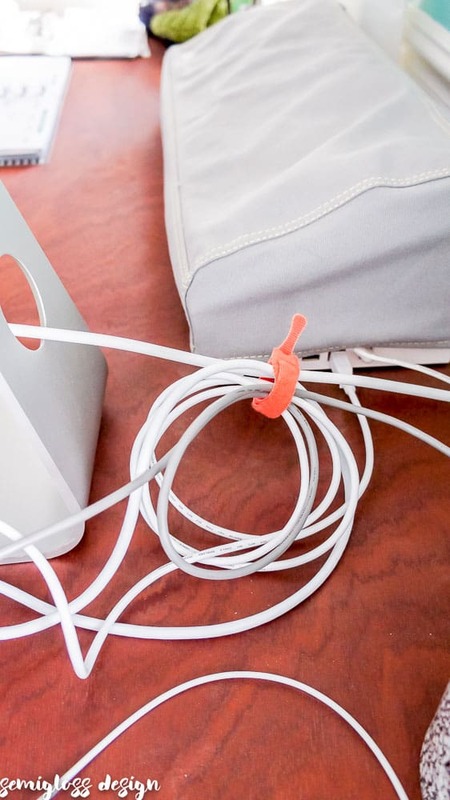 A simple hook and look cable tie corrals the wires out of sight. My shelf was also reorganized, which mainly consisted of me throwing stuff away. It’s nice to know where everything is now. I’m so happy with my office makeover. Let’s check out those finished rooms!! awesome work, emy! i love the furniture makeovers! Looks great!! Love how the cabinet turned out under the desk! Such a great idea! Your space is gorgeous. I bet you want to spend all your time there. So much light and the colors are bright and energizing. I especially love your unique spin combining vintage and new pieces together. Great makeover!! The blush pink dresser <3 and three cheers for organization! Awesome job, Emy!! This space is beautiful and totally ready for creativity! I love a clean desk too. Enjoy the new room! It looks great Emy! Everything is bright and fun. Oh, Emy! It’s so beautiful! I love love love your pink fringe lamp and am so happy to see it brighten that corner. 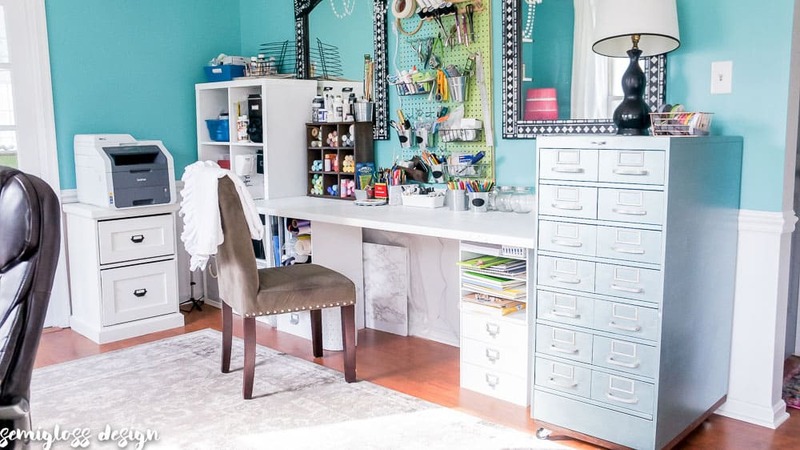 What a beautifully organized space. You did a great job! I could use a million exclamation points – MILLIONS!! I love this room! What a creative way to cover old chairs! I need to try this trick! I love this Emy! 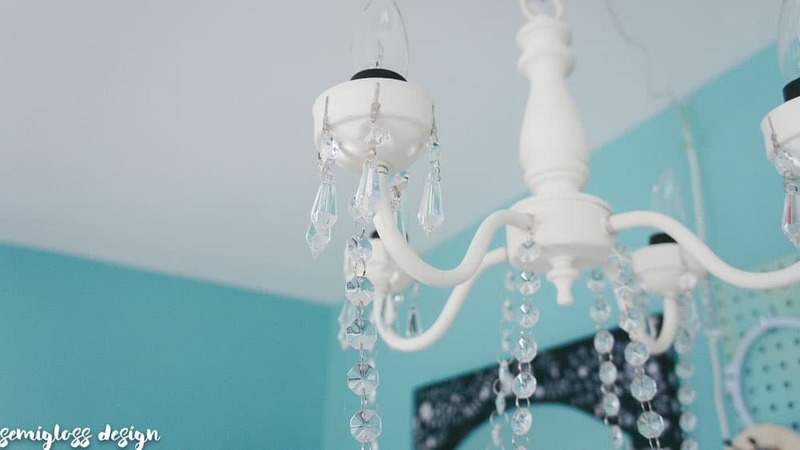 I love the pops of pink with the aqua! And I’m super impressed with how you organized everything in this space. 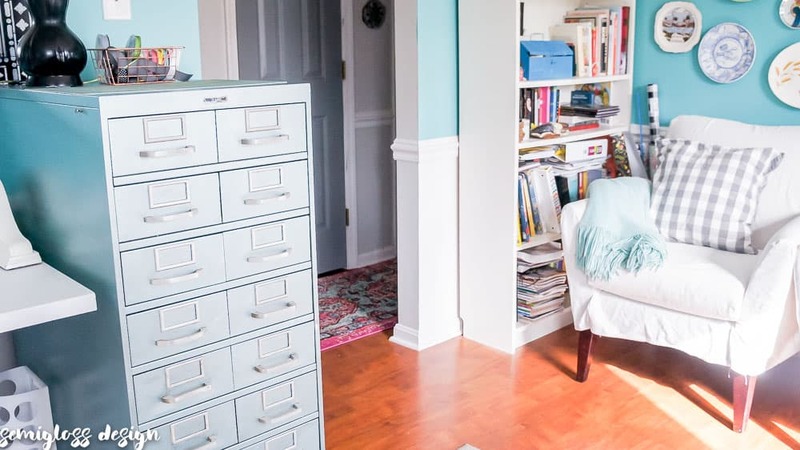 I think my favorite part is all of the different furniture transformations you did here-love it! 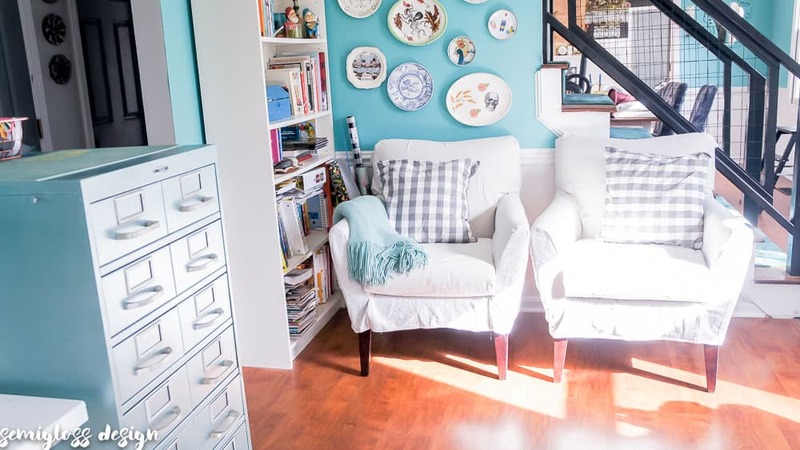 This space is so bright and cheery… and organized! I am so happy you were able to create a space you love, that feels like “you”! Thanks for joining in another round of the challenge!!! it looks great, what a fun space to work! I love all of the white pieces! It looks fantastic, and I still love the color of that room! What a great space to work in! You sure got a lot done in 5 weeks… Taming the cords in my home office would take that long… It all looks great! Clean desks make such a difference! 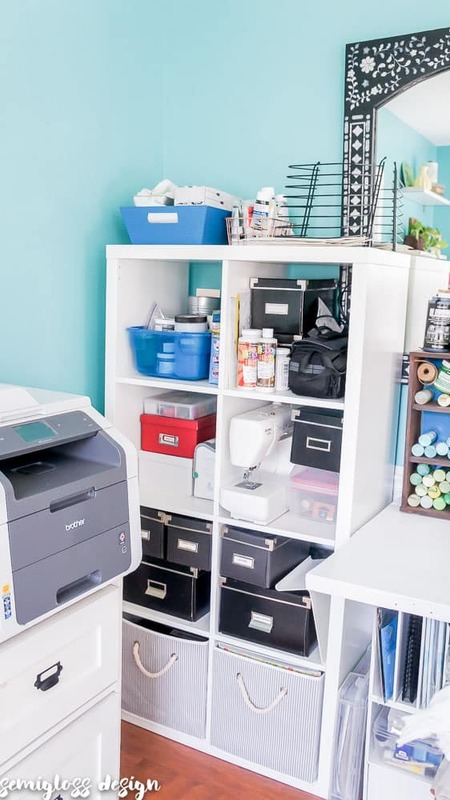 I love everything you’ve done in here, especially all the storage solutions. That dresser is gorgeous! I could really get some work done in a space like this! 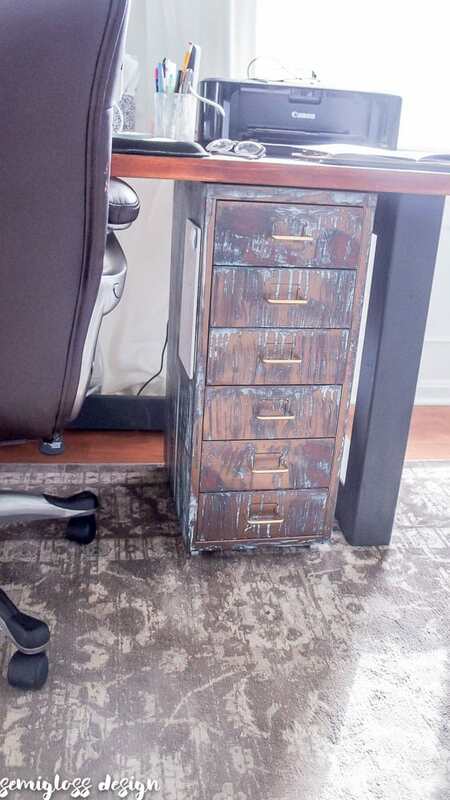 That filing cabinet is so cool! 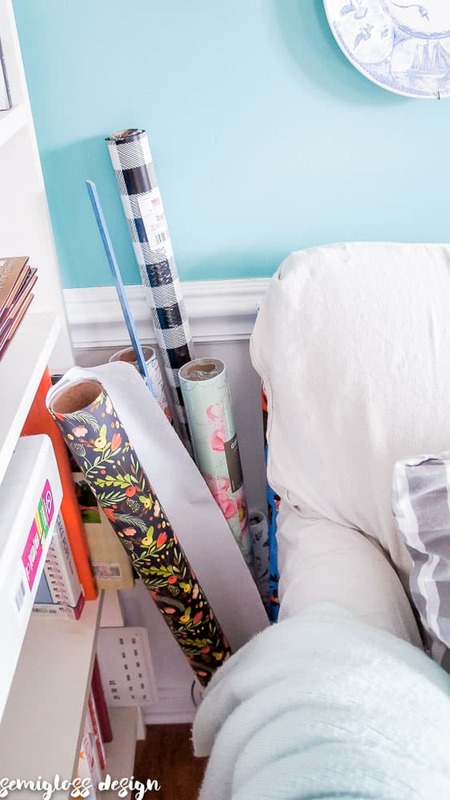 Yay to getting everything organized – it looks great! Emy, it looks amazing! 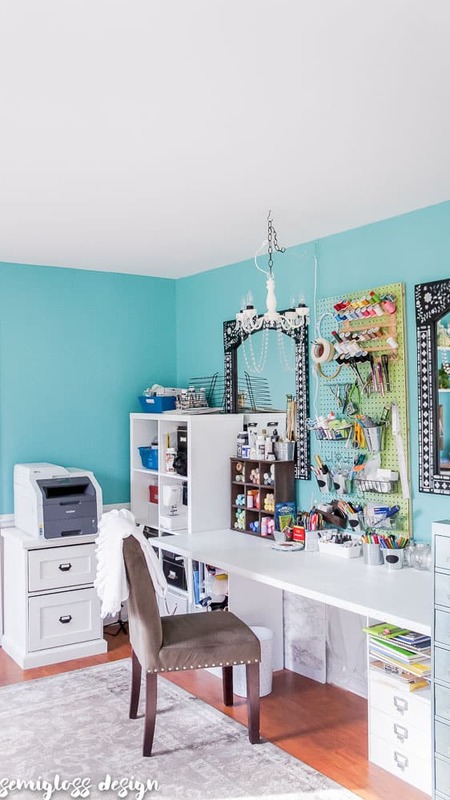 I can’t tell you how jealous I am of all of that space to create! Your pieces are beautiful and I can imagine all of those colors are so inspiring! Great job! Yay for staying on budget and for having such a well-organized inspiring space now! Emy, this is amazing! I just want to come over and craft!! All your makeovers are so pretty and I love that chandelier you made! 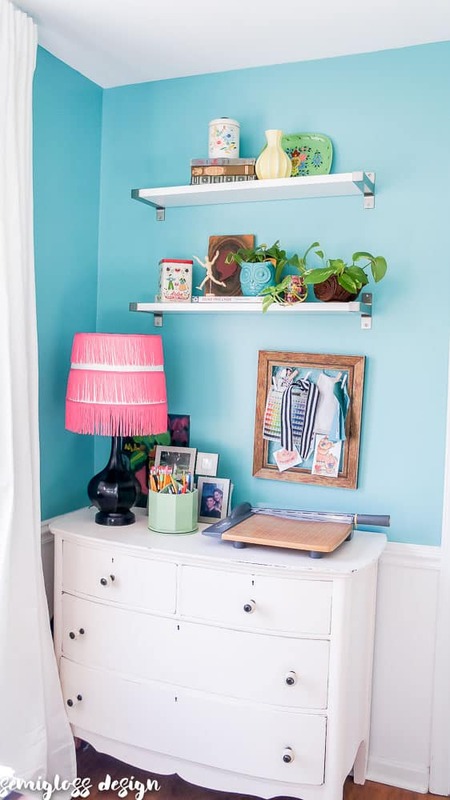 The blue paint is so bright and fun – you really did a fantastic job on this room and I bet you are loving it! 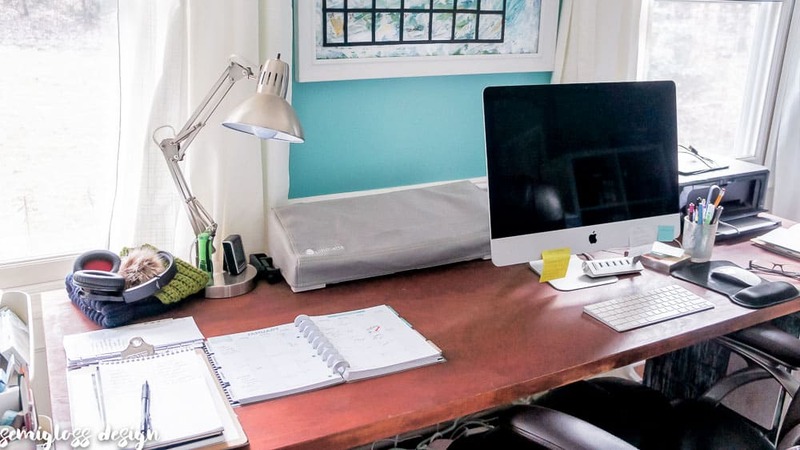 What an inspiring space to work! Everything is looks clean, bright, and beautiful. Love that patina! This is such a fun space. I can tell just by looking at it that you have a fun loving personality. I hope one day to be as organized as this!!! Emy, what an amazing space! I love all of your furniture make-overs – it just pulled everything together. I can completely see why you’re feeling so inspired working in there. Fabulous job! 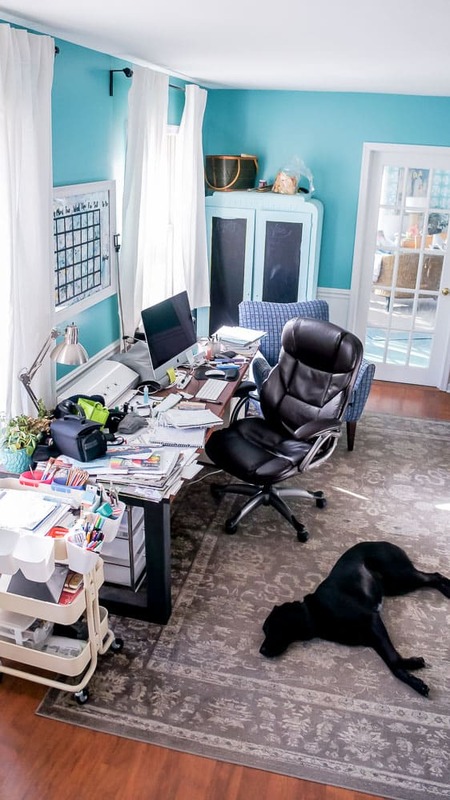 I hope to have an office/creative space that looks as amazing as this one day!! I just love your vintage cabinet, the chandelier, and your drop cloth slipcovers sure look amazing to me!